Please order your NOB t-shirt by THIS FRIDAY so we will have them by the elementary school performance on May 16th! Friends and family are absolutely free to order shirts, as well! The more shirts we order, the lower the price! NOB Rehearsal Schedule can be found HERE. ​Note: We will be rehearsing on Tuesday, Wednesday, and Thursday vacation week from 10-2. Times are negotiable, please let me know. Time to hit the ground running, folks! Lots of stuff for this week! NOB rehearsals for the entire week will be by appointment with me, only, beginning on Tuesday. Shoot me a Jupiter Grades message if you would like to run parts/discuss anything about your numbers. Any HS students interested in crew positions for the upcoming NOB production should fill out the following form. Amazing job at solo auditions today, everyone! We are going to have quite a show! Audition cuts for all group number solos are up in the Team Drive in the CAST folder. Please check them out and review for TUESDAY. This could be another long day, so please plan accordingly! Thank you so much to everyone who came out to audition for Night on Broadway tonight! We were blown away by all the talent and it is always so difficult to narrow down a program! I want to remind everyone that there are still TONS of solos up for grabs in the group numbers! Please check out the Team Drive for details! I'm so very excited to work on this production with you! The Drama Club will be participating in NHS Trunk or Treat next week! After rehearsal, let’s hand out candy from the back of The Blueberry (or should I say the Boo-berry?! ), blast some showtunes, and advertise OOTI and NOB! Please let me know if you are able to attend! Here is this week's rehearsal schedule! Hey everyone, we have chosen our T-Shirt design and are now ready to order them! Please follow this link to order your shirt if you would like one! At the moment they seem a bit pricey but if more people order the price will then go down. October 16th is the last day to buy one!Hey everyone, we have chosen our T-Shirt design and are now ready to order them! Please follow this link to order your shirt if you would like one! At the moment they seem a bit pricey but if more people order the price will then go down. Here is this week's rehearsal schedule. Here is this week's rehearsal schedule. Please note the start time on Wednesday's rehearsal, due to the early release day. First rehearsal schedule of the year! ​Note that I need everyone to update the CAST/CREW SCHEDULE document in drive so I can build an effective schedule each week! ​I have set up a Remind classroom for the show so you can get instant announcements right to your phone. You can access the invite code by going to the Team Drive > Announcements > and the PDF file titled ootiinvite. ​Crew Chiefs, once you join the group, I will change your status to teacher so you can also post announcements. One of our summer rehearsal dates (TBD) will be exclusively for a drama closet clean out. If anyone has organizers or cubbies that they wouldn’t mind donating to the club that would be greatly appreciated! If you think you have something that would do the closet some good (shelves, hangers, etc) then definitely let us know! If you have anything you are willing to donate then please contact Steph! Attention OOTI Cast and Crew! Please fill out the Google Form in the Team Drive Announcements folder regarding summer rehearsals NO LATER THAN TUESDAY, 7/10. Thank you! Attention, OOTI cast and crew! Please add your preferred method of contact to the forms found in the Team Drive. If you are on both cast and crew, please add your contact info to both. Note: All contact from me will be through the website, Facebook, or JupiterGrades. Only list a form of contact that you are comfortable with your peers using for you and that you check regularly. Thank you! I am proud to announce our production teams! Please see the full list on the Fall Musical page! I am so impressed with the quality of talent that came to audition for our youngest role in Once On This Island today. Please welcome our Little Ti Moune: Meagan McEnaney! Update for Little Ti Moune Auditions: We will be needing a young actress with medium brown to dark brown/black hair for our production of Once On This Island! Reminder that auditions with be on Tuesday, June 12th at 3:10 in the CMHS Auditorium! I am so blown away by what I saw today at auditions! I have honestly not experienced a tougher casting process than this one. I'm so proud of all of you! Results are on the Fall Musical page! Please sign up to bring food to Miscast! ​Hi everyone! So for those of you involved in MISCAST, please order your shirt through the link below! At the moment the cost of the shirts is $10, but this is with an estimated 20 orders. This price is subject to change depending on how many people order. YOU MUST ORDER BY THURSDAY FOR US TO GET THE SHIRTS IN TIME!!! Ideally, we would like all cast members to wear a shirt for the performance, so that we have a cohesive look. Also, parents are welcome to purchase a shirt as well! If you have any questions, please ask Ms. Sjolin or myself! NOTE: You must pay online, and their is a women's and men's shirt option! Sjolin adding to note: The only reason we are doing the pay online option is because of the quick turn around. If we need to wait for a check from the school, we won't have the shirts in time for the performance. Thank you so much to everyone who auditioned today! I am proud to announce the performances for the very first Miscast Gala! We are ordering sweatshirts! If you were involved in HS drama this year or if you plan to be involved in HS drama next year, please place your order by 5/5! I wanted to make sure that I got this info out nice and early. Due to the dance-heavy nature of this show, I would like for those interested in applying for Lead Choreographer to provide a short "audition" of their work. Interested students should work up some sample choreography for "Ti Moune's Dance". Please use contemporary, modern, and Afro-Caribbean styles as references. Please plan to present the choreography on the same day as the cast auditions (TBA). Note: the Lead Choreographer can be a member of the cast, if they are comfortable with the large work-load. Please see the Fall Musical page for more information! The audition date is still pending and will be posted here ASAP. If you would like to order lunch from Dandy's on Friday, please fill out the following Google Form. Rehearsal schedule! Note that beginning next week, all scheduling conflicts (barring emergencies) should be RESCHEDULED. Okay, this is what we are going to try and do! Anyone who is available to stay later after tomorrow's rehearsal - I will stay as long as you like to run whatever acts we can in the chorus room. Then, we will rehearse from 1-4 this Saturday. (Sorry, I can't do our regular weekend rehearsal schedule, I will be coming straight from Jr. District). We won't let a little snow get us down! This show is going to be amazing! Less than one month out! I hope everyone had a wonderful break! Here is this week's rehearsal schedule. We are really buckling down, as we are about one month out now. Please show the dedication that I know you are all capable of and be present at rehearsals. If, for any reason, you are unable to attend a rehearsal, it is your responsibility to work especially hard to catch up on what you missed; and, as always, good communication is key! If you have not done so, please work out what you are wearing for each scene and report your costumes to Kaylin. If you do not know what you need to wear, Kay can help! If you own a pair of tap shoes, please bring them to "Step In Time" rehearsals from this point forward. We need to start practicing with some stand-in props for "Step In Time". If you have a small broom, please bring it on "Step In Time" days; a dowel or other like item will also do just as well at this point until we have our official props. If you plan to leave this item at the school, please label it. Here is this week's rehearsal schedule! Please note how importance your attendance is as we really buckle down on choreography and staging. I do not want to rehearse over February break, but if we can't make some serious progress, then we may be forced to. This is completely in your control! There will be no Night on Broadway rehearsals this week. Please go and support your classmates and Shane Gives Thanks at "No One Leaves Hungry"! This week's rehearsal schedule! Note that I still haven't received Mr. McLean's schedule for the week, so I tried my best to avoid conflicts, just know that "No One Leaves Hungry" rehearsals take priority at this point. This week's rehearsal schedule. Note that we will only do a full cast rehearsal on Monday (the only full day for HS students). The other days, scheduled performers are expected to come back to school at 2:10. We had our first high school full cast rehearsal today and only had about half of the cast present. I would like to remind everyone that a "no call - no show" is absolutely unacceptable. If you cannot make it to a rehearsal, it is your responsibility to get in contact with me (either in person or through email) and let me know. Thank you to everyone who came out to audition for the group number solos this afternoon! Here are the results! Here is this week's Night on Broadway rehearsal schedule. Raise Your Voice - All interested soloists should prepare first chorus. In addition, Mary Robert should prepare Latin belt part. You Will Be Found - Evan should prepare first chorus, Alana/Jared/Zoe should prepare Alana/Jared verse. Announcing the cast of our Night on Broadway Middle School feature! We have OVER 40 STUDENTS participating! Mrs Johnson and I can't wait to work with you all! Reminder that we will be auditioning the solos on Wednesday, January 3rd after school in the chorus room! Thank you so much to everyone who came out to audition! This was the longest round of auditions yet - Matt and I left at around 9PM! The program for this year's production is on the Night on Broadway page. I can't wait to get working with you! Have a fantastic holiday season! Night on Broadway audition sign ups at the following link! Note that these are 10 minute time slots and more than one song can be auditioned in each slot. Please time your songs to make the best use of the schedule. A few announcements for this week! - LIGHTING CREW! Christina Verde will be visiting this week to get us set up. I will keep you posted, but please be prepared to make yourself available. - Reminder that our off-book date is October 30th! Here is this week's rehearsal schedule! Note: we will be recreating the original Playbill art with our cast on Thursday. Today's rehearsal has been canceled. Enjoy your long weekend! Here is this week's rehearsal schedule. Note: The photographer will take portraits for headshots Monday, Tuesday-Thursday will be set build days, and we WILL rehearse Friday but NOT Monday. Here is this week's rehearsal schedule, and note that Tuesday and Wednesday are set build days. Get the word out! The official off-book date for Spelling Bee is Monday, October 30th. So sorry about the late update. Here is this week's rehearsal schedule. The sitzprobe/pit rehearsal has been changed to Sunday, November 12th due to prior commitments of pit musicians. Welcome back, everyone! Here is the rehearsal schedule for this week. We are all hands on deck these three days and, from here on out, we won't necessarily need everyone every day. Please remember that communication is key and if you have a conflict, you MUST let me know as soon as you find out. All conflicts must be communicated either in person or through e-mail. Communication through a third party is not acceptable and is unprofessional. A "no-call no-show" situation qualifies you for possible replacement in the production. Remember that this show will only be as good as YOU make it! Can't wait to continue working with you! Hello Spelling Bee cast and crew members! I am absolutely amazed with the progress we have already made, and the school year hasn't even begun yet! I noticed last week that we had some costume items beginning to come in and that is FANTASTIC. The sooner we have costumes, the sooner we can do in-character promotion. - Check the Team Drive in the Costumer folder to see the documents that Kay has sketched out for each character. She has some amazing ideas that I'm super excited for. - Make sure that you check in with Kay before purchasing/making anything for your character. We just want to make sure that we're not accidentally doubling up on any items. Plus, we may already have some items in the drama closet or they may be donated, so save yourself the stress! Thanks again for being your awesome selves! Here is a detailed rehearsal schedule for Thursday, August 10th. A fantastic job by all today! I am so thrilled to have such a wonderful group of people to work with. Let's keep it up! ​Here is the detailed rehearsal schedule for Tuesday, August 8th. Here is the detailed rehearsal schedule for Monday, August 7th. Could all cast and crew members of The 25th Annual Putnam County Spelling Bee please fill out this form to formally RSVP to next week's rehearsals? Thank you! ​Stay tuned for preparation requests for crew members! It's here! The first rehearsal is here! Bet you aren't as psyched as I am! CAST: Your score and script, and a pencil. CREW: A notebook of some kind, a pen and/or pencil (it may be helpful to have both handy), and your script (if you don't have one yet, no worries, as we will be making more copies tomorrow). If anyone has a laptop that they are comfortable bringing to work on Google Drive, it would be helpful as I'm not sure which (if any) school computers we will have available to us. We will have the use of my office computer and my Chromebook, but just those two devices don't make it amazingly easy for collaboration. ALL CAST AND CREW MEMBERS! Please fill out the following RSVP for next week's rehearsal. Please spread the word to any cast/crew members that have not been in contact this summer. Note: I have not heard from the following students yet this summer - Mike Pompei, Matt Ryan, Andre Meservey, Jess Pompei, Charlotte Gedraitis, Olivia Rush. Summer rehearsal schedule for "The 25th Annual Putnam County Spelling Bee"! Please spread the word to your cast/crew mates who don't check the website/FB group during the summer! Note: I would love to schedule one more day when most of the cast is available, but I did not receive a response from everyone. Please let me know your availability ASAP. Rehearsal Schedule Survey, Take Two! Narrowing it down! All cast and crew members should fill out the following form by this Friday (6/30) so our summer rehearsal schedule can be finalized! Survey to finalize summer rehearsals! Please fill out the following survey ASAP to indicate your summer availability. The sooner I hear from everyone, the sooner I can send out another survey to help narrow it down to approximately five rehearsal days. All students who are interested in holding crew leadership positions for this fall's production of The 25th Annual Putnam County Spelling Bee should submit a letter of interest to Ms Sjolin by Tuesday, June 20th (the last day of school) at 5PM. Letters may be submitted in person as a hard copy, or shared on Google Drive. All letters should include the following information: the position you are applying for, your past experience in theatre, your skills that would make you a strong choice for this position. Note: the position of Set Designer is already filled as part of an independent study. All other leadership positions need to be filled. If you are interested in working on crew but do not wish to hold a leadership position, please message Ms Sjolin on JupiterGrades to indicate your area(s) of interested. 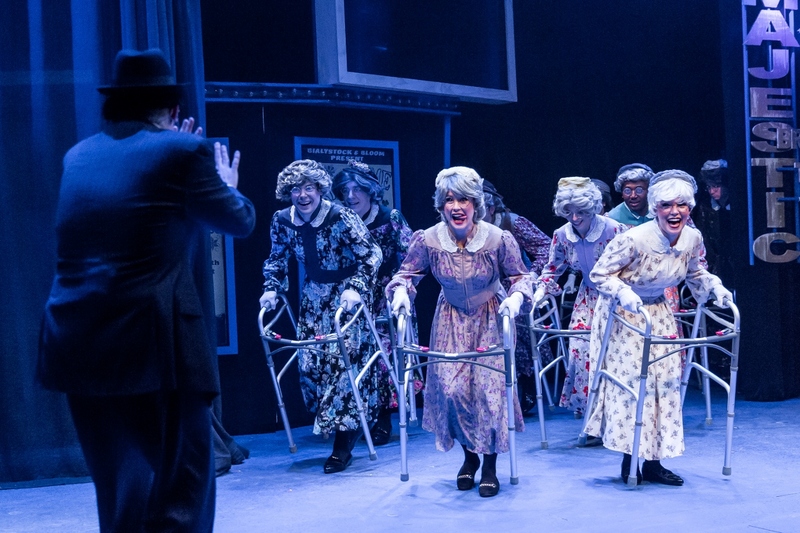 You can now follow our theatre group on Facebook. Check it out for information, pictures, and videos from our auditions, rehearsal process, and performances. Simply search CMHS Musical Theatre or username chsmustheatre to join. Check out the Fall Musical page! Auditions for next year's musical will be on Tuesday, June 13th at 2:10pm in the auditorium. I would like to cast the show in one day, as we did with Godspell, so please clear your schedules now to be available on that day. Get psyched! Also, if you don't have a permission slip for the Rock of Ages field trip, please come and grab one off of the piano and turn it in ASAP. I will contact all attending students with the official cost this week. It will be $30 - $35. It's foolish to think that it needs saying, but attendance is absolutely mandatory this week - no questions asked. Also, all costumes and props should be in building no later than Tuesday. I will be there once my faculty meeting is over and we will sit down to assign all voiceovers and skits, and then continue to work anything that needs further time. 2:15 - 5:00 Full Cast - Complete run of show with lights and costumes. 2:15 - 5:30 Dress Rehearsal Please note that this is an early release day and you MUST arrange for transportation accordingly. TBA - You will be informed at the end of dress rehearsal of any numbers that need to be further rehearsed. If we are not rehearsing your number, you will not need to attend. Also, please share the heck out of our Facebook event! Please see the following links for ideas for costumes. All props and costumes should be in building no later than Monday, April 3rd. Final week of rehearsals before production week! THESE REHEARSALS ARE MANDATORY FOR ALL SOLOISTS. PLEASE PLAN TO REARRANGE ALL NON-EMERGENCY ITEMS IN YOUR SCHEDULE. The long hours this week will allow us to simply run and polish things during production week and get out of here earlier. If cast members do not adhere to the following schedule, we will be forced to keep longer hours during production week. Completely up to you! I, personally, would like to lesson the work load that week! We will run all acts (mostly) in show order and will fix things as we come to them. You are expected to be working on your acts around the auditorium if you are not needed on stage in order to use time most effectively. We're officially coming down to the wire, now! We have two weeks to work before production week, and keep in mind that we have some conflicts within those two weeks (Senior Show, Sr. SEMSBA, March Music Madness). This means that these rehearsals are of the utmost importance. This is a reminder that this show will only be as good as you make it. I cannot do it for you, but I do have great faith in you. 3:15 - 3:45 Open rehearsal time for staging. First come, first serve. 2:15 - 3:15 One Day More (Staging) Reminder, this is a number that the ENTIRE cast should be in. 1. It was announced at the informational meeting in December that ALL CAST MEMBERS are expected to be part of the following numbers: 96,000 (Opening), One Day More (Act I Finale), Flesh Failures/Let the Sunshine In (Act II Finale). This is important in order for the ensemble numbers to be strong. 2. No call/no shows at rehearsals are utterly unacceptable. I understand that conflicts happen, but all cast members are expected to contact me directly (in person or via e-mail only, NOT through another person) in the case of an anticipated absence. Please fill out the following Google Form to let me know which other group numbers that you are a part of so I can inform the choreography team of our numbers and we can get things rolling. Thank you so much! Note: The following acts have not scheduled any rehearsals with me since casting. Please plan to schedule a rehearsal this week or see me about your rehearsal plans. NO REHEARSAL, ENJOY YOUR LONG WEEKEND! Many thanks to everyone who came out to audition for Night on Broadway! We heard 100 different auditions! Absolutely ridiculous in the best possible way! Incredibly, nearly all of the songs that we heard were of performance quality and I highly encourage everyone to keep their various songs in the back of their mind and bring them back for future Night on Broadway auditions! Check out the Night on Broadway page for our list of performances. All solo auditions for group numbers will occur after the holiday break. Links to the audition sign-ups are now posted on the Night on Broadway page. Welcome to production week! Just a reminder that all props and costume pieces should be in by tomorrow and we should be practicing in costume every day at this point. Also, please remember your Secret Psycher gifts! If you are not sure how to secretly deliver your gifts, please feel free to leave them backstage any time during the day. 2:10 - 5:30 Full Cast (I have a meeting until 3) Please clean up whatever you need to and get everything set and ready to go during the first hour. We will be fixing anything that went wrong at the dress rehearsal. We will not stay until 4 if we do not need to fix that much. 6:00PM call, 7:30 curtain. As with the dress rehearsal, if you need more time for costume/makeup, please arrive earlier. Any makeup appointment requests must be arranged before the end of the school day on THURSDAY. All cast and crew members are expected to stay until the entire set is appropriately packed away, all props and costumes are neatly stored in the closet, and the auditorium is clean. This is MANDATORY. Please see Maddie for your clean-up assignment, as everyone has a job. It's the final rehearsal week! As you can imagine, this means that your attendance and focus is of the utmost importance. Please remember that this production will only be as good as YOU make it. 2. Mrs. Archer is also going to be taking headshots tomorrow to accompany the bios in the program. Please plan to wear a black shirt/top (nothing specific, other than color), so we have a little bit of uniformity. Please spread the word through a text chain or something so we can get word to folks that don't always check the website before Monday. 2:10 - 5:00 ​Full Cast - Full show run!! THIS IS OUR OFF-BOOK DATE. ALL LARGE BLOCKS OF MONOLOGUE SHOULD BE MEMORIZED AT THIS POINT. OTHER DIALOG SHOULD BE FAMILIAR AND YOU WILL BE ABLE TO CALL FOR LINES. 2:10 - 3:00 Full Cast/Crew Chiefs - fill out bios if you have not already done so. Meet with David to go over rhythm part for Samaritan story. Friday 10/7 Please note that this is a day off for students, but we still need to rehearse. We will, however, have Columbus Day off. Please contact me if you are concerned about transportation and we will work something out. 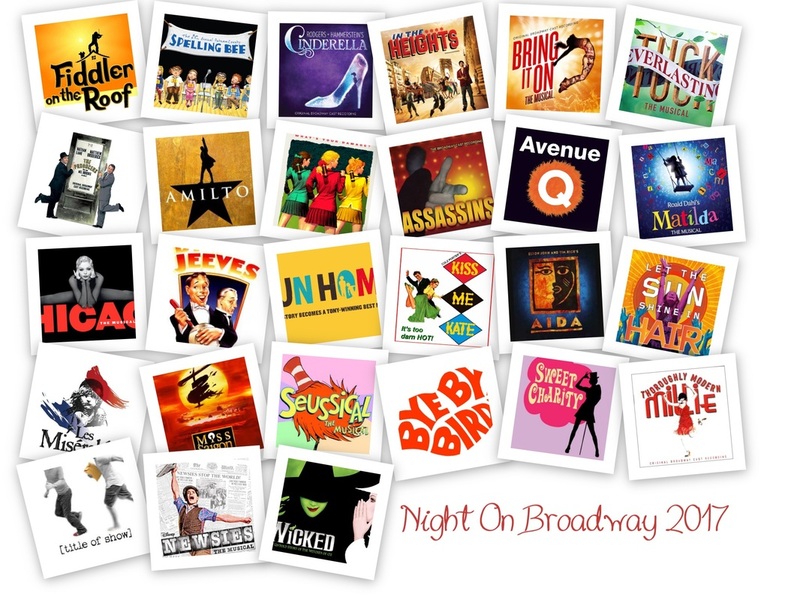 Make sure to check out the Night on Broadway page for updated lists of shows and songs with Youtube reference links! 2:10 - 4:00 Sydney, Charlotte, Olivia, Jenna, and Tanya (Sydney and Charlotte teach other members "All for the Best" and "Alas for You"
Seniors on field trip + Sjolin has plans = you get a day off! Please check the props folder to see if you can bring something in! Please fill out the following form to let me know your availability prior to Labor Day weekend. I hope you all had a fantastic summer and I can't wait to see you all! Check out the company folder in Drive to view any rehearsal materials that I have slapped together. You will see a pdf of the song/selection as well as mp3s that isolate each individual part so you can practice. At the moment I have all parts up for By My Side. Ladies, please try and take a look at them before our next rehearsal. If you do that, things will go so smoothly! The 'lamps' section of Learn Your Lessons Well​ is coming up next. I am SO proud of all the work that has been done thus far! This is going to be a very strong performance, I can just feel it! That being said, let's keep up the good work so we're not in serious crunch time once school starts and people have more conflicts. Let's rehearse once a week in August. Please shoot me an email to let me know which rehearsals you can make and which ones you cannot. This is a reminder that we will be rehearsing from 10-2 tomorrow! Hope to see you there! ​Rehearsals may be scheduled by email at least 24 hours in advance. Thank you so much to everyone that came to today's rehearsal! We got so much done and it makes me so excited for all of the work that we still need to do. Please check out the company folder on GoogleDrive for some of the ideas that we have had. - Choreographers mapped out the staging for 'Turn Back, O Man' and 'By My Side' - they look great! It would be fantastic if cast members began to brainstorm what they would like their costume to be. I will create a file for each character. Please start searching and stick some ideas in there. It will be very helpful for the costumers to know what they are looking for. Also, I will be in the building on Wednesday at 12:30PM if anyone would like to show up to work on something! Please fill out the following form so I know who to expect for rehearsals! Can't wait to work with you! Remember, this show will only be as good as YOU make it! More July rehearsals? Up to You! Not available for the rehearsals on 7/11 or 7/20 but still want to get some prep time in? Or do you want more time besides what I have scheduled? By appointment only, I will come in to the school any day this upcoming week or the next to work with cast members or choreographers. Just let me know at least 24 hours ahead of time and tell me what time you would like to work. Please take advantage of this! Email me to schedule rehearsal time! Please spread the word to folks who didn't fill out the poll. Due to the number of conflicts, I will make myself available for rehearsals twice in the next two weeks. Please fill out the attached form to help me decide which days we should work. Thank you! I hope everyone is enjoying their vacation! I just sent out an invite to cast members detailing which part you will be singing in each song. Please mark your scores so you are not lost at our first rehearsal. Speaking of our first rehearsal, I have not received availability from most of the cast/crew. I can not send out options if you don't keep me informed. Please be responsible and help me help you. We are still missing gmail addresses from the following people. Please remember that we will only be successful in this production if we do all of our planning during the summer. If anyone could contact/text these people and remind them to provide me with a gmail address, that would be amazing. Thank you! I hope that everyone is enjoying their summer thus far! It's time to start thinking about when we will get together this summer. I would like to have one day in July and one in August. Could everyone (cast and crew) please email me your availability at thisbirdcansing@gmail.com. Based on your schedules, I will create a poll so we can decide on the best two dates. Also, please remind your friends/new crazy drama family members that they must provide me with their gmail address in order to take part in our work on GoogleDrive. Crew assignments are now up on the Fall Musical page! Also, please remember to go to the forum and provide me with your personal Google e-mail address so we can continue to work over the summer. We are still looking for a House Manager and a Set Designer for our production of Godspell. Interested parties, please share your application with me through GoogleDrive ASAP. I really want to begin goal setting with the crew, but we can't do this without strong leadership! We will have our first read-through this upcoming Friday, June 17th at 2:05. Please note the start time, as I do not have early release days like you do. If you are concerned that you will not be able to get a ride back to the school, you are more than welcome to stay through in the auditorium. Hi Everyone. As of this morning, I have not received close to enough crew chief applications. Remember, these were due last night as I wanted to announce crew teams by tomorrow. This show will NOT be successful without a committed and responsible crew. Obviously, you can see that this does not bode well at the moment... I will extend the application deadline to be Monday night. I will plan to announce all crew positions by Wednesday. This is a reminder that all applications for crew leadership positions should be shared with me on GoogleDrive by Saturday night. I really want to announce all of the crew appointments by no later than Monday so we can start forming a plan of attack. Let me know if you have any questions! Congratulations to everyone who came out to audition for Godspell this afternoon! I was so impressed with every last one of you and I hope that you will all continue to help us out as part of our drama family. You will find the cast list on the Fall Musical page. Crew assignments will be posted by Monday, at the latest. Our end-of-the-year Open Mic celebration will be on Friday, June 10th from 2:30 until approximately 5:30. Please sign up to bring food and drinks or to perform! Rehearsal tracks are now up on the bottom of the Fall Musical page. I have also indicated where in the Youtube video the "call-back" auditions take place. Remember that the better prepared you are, the stronger your chances of being cast! 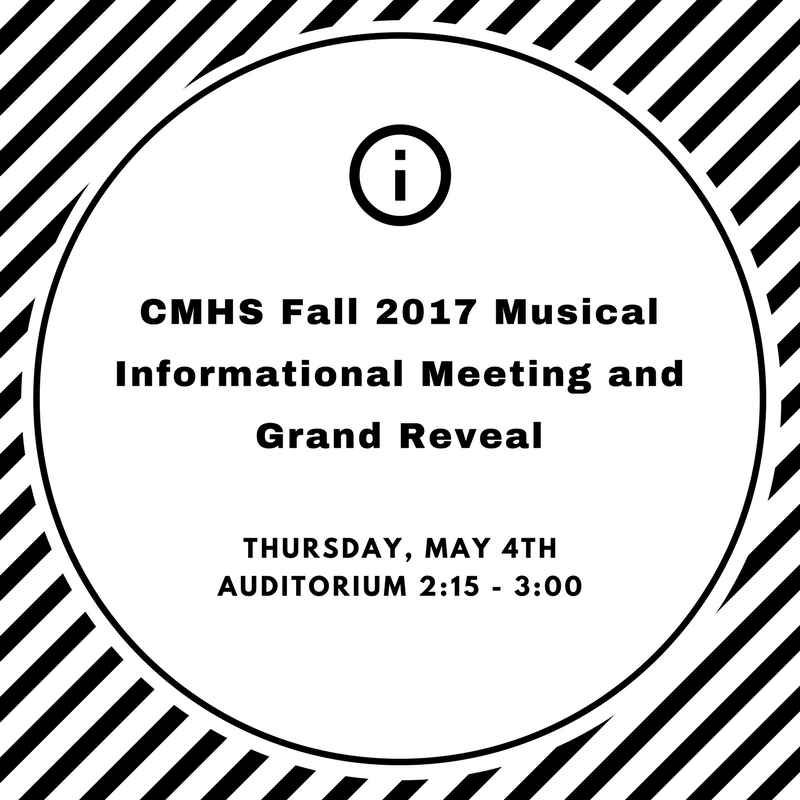 It's almost time to announce the fall musical! Please spread the word that we will be having our informational meeting and Grand Reveal on Tuesday, May 17th after school in the auditorium! In addition to announcing the musical, audition materials and information for crew positions will be distributed. I hope to see a ton of people there, so spread the word and let's help our drama family grow! If anyone is available to stay after tomorrow (I won't be available until around 3:15) to start moving the Oklahoma! set pieces out to the trailer, that would be amazing! We really need to get the stage cleared tomorrow because Crusader Pride is on Tuesday afternoon. Any help is much appreciated! ​Please welcome the following future 8th grade students to musical theatre for the 2016-2017 school year! If you see them, please make sure to show them some of the love that runs rampant in our wacky little family! Welcome To The New Home Of CMHS Musical Theatre! In an effort to create a more visually pleasing and more user friendly site that doesn't require you to be logged in to the school Drive account, we are giving this a shot! Please let me know if you catch any bugs or something that is less than intuitive!